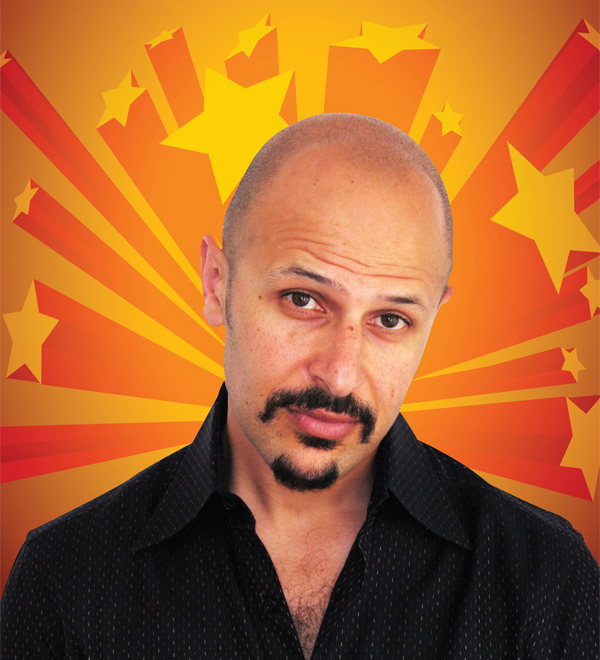 At first glance, there’s nothing too amusing about racial profiling, illegal detention or the ongoing erosion of civil liberties; but for Iranian American comedian and actor Maz Jobrani, such issues are grist for the mill. As a member of the Axis of Evil comedy tour, Jobrani addresses the reality of what it means to be of Middle Eastern descent in America today. The group, composed of Jobrani, Egyptian American Ahmed Ahmed and Palestinian American Aron Kader, gets its name from President George Bush’s comment in which he famously declared Iran, Iraq and North Korea the “Axis of Evil.” Taking on such intimidating topics is an act of courage, not least because they run the risk of bringing unwanted attention to themselves in an era when dissent is discouraged. But beyond that, Jobrani’s humor is that of a disciplined man who knows how to turn difficult experiences into a unifying force, without casting blame or allowing anger to overwhelm humor. Based on the reactions of audiences at home and internationally, his message is a welcome one, allowing Americans and Middle Easterners to see beyond cultural divisions to their commonalities and to laugh at the inexplicable behavior of their politicians. In addition to doing stand-up, Jobrani has also been in films, including The Interpreter, Friday After Next, and Dragonfly. Most recently he starred in the television series The Knights of Prosperity. He spoke with SC Magazine about the process of making oppression funny. SC: What was the deciding factor for you in moving forward with the Axis of Evil Comedy Tour? MJ: One of the things that happened, right after September 11th, was that I felt that I couldn’t be funny again. The world just didn’t seem funny. What happened was wrong in a human way, but secondly, it was going to have a big impact on the lives of people from the region of the world where I’m from. There was a moment in time where the United States could really have rallied a lot of countries together. Iran even sent their condolences. And instead, what seemed to happen was this stance that became kind of over-aggressive, to the point where you’ve got people falsely accused, or rights that are being taken away or bombs that are being dropped, collateral damage that’s being done. It became like, wait a minute. This isn’t how I thought it was going to turn out. So you see things like that, and a combination of all that stuff made me realize it was time to get back to business as usual, in terms of identifying hypocrisy and showing these events as much as possible from my point of view. SC: To what extent do you find, particularly in the U.S., that what you’re doing is educating people? MJ: Definitely. I just did a show last night at the Laugh Factory in Los Angeles. It was a younger Latino crowd, early 20’s. When I would bring up certain stories, a couple of them would nod. The rest of them were kind of looking at me with a blank face. But when the jokes would come, they would laugh. In the end, I felt, okay, these guys actually went on this journey with me and they were great. SC: A lot of the fodder for your comedy is things that certainly could be fear inducing or make you feel angry or helpless. How do you turn that around, turn it into comedy, and make it something that actually brings people together? MJ: I think a big part of it is to start off by being vulnerable and kind of being self-deprecating at points. Saying, this is where we’re at, so what are we going to do? Am I going to go up there and yell about it? Or even if I yell about it, there’s a funny way of yelling about it. I think that’s what a comedian does. They show us the absurdity of our own reactions. When you’re in a rage, you see how silly you look, and how silly the whole battle is, whether it’s over a long distance call or in this situation, where it’s over a lot more serious issues, like the war in Iraq or the practice of rendition. We met this Arab man, Khaled El-Masri. He was a German citizen, and he was at a border crossing in somewhere like Albania. His name matched someone’s on a terrorist suspect list, and they arrested him on the spot. He was sent to Afghanistan. They held him there and they basically tortured him for six months. Then they found out, wait a minute, we’ve got the wrong guy. You’ve got to humanize it, you’ve got to talk to them like you’re a friend of theirs. Hey, we’re all in this together, and here’s my experience. SC: It seems like you’re dealing comedically with two separate sets of fears. 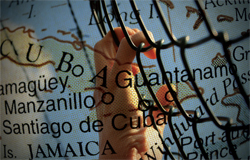 On the one hand, there’s the fear for all Americans of Middle Eastern descent of these things that are looming in the background, like extraordinary rendition and Guantanamo. For other Americans, there’s the fear of terrorism, of having their plane hijacked, etc. MJ: Absolutely. I do a whole bit about traveling and me being scared of myself. So people are saying, oh, that’s funny; he’s from Iran, and he’s just as scared as I am. You’ve got to humanize it, you’ve got to talk to them like you’re a friend of theirs. Hey, we’re all in this together, and here’s my experience. SC: I’ve noticed with even with your routines about Bush and bin-Laden and Ahmadinejad, you manage to make them seem almost cuddly. * Is that intentional? MJ: It’s more that when I look at these people who are our leaders, I’m shocked sometimes by what they say. Somebody at Columbia University asked Ahmadenijad, what’s going on with gays, and he said, “We don’t have gays in Iran.” Or George Bush gets on an airplane for ten minutes in a little flight suit and lands, and says “Mission Accomplished.” Don’t these people think? There are some filters that we all have that they don’t. But then again, I think we all do silly stuff. So, they are people; let’s just point out their silliness; that’s kind of the way I’m going after them. What happens if you get too angry or too specific, like about a policy issue that you try to describe on stage, that’s a hard thing to make funny. You have to have really the right audience for that. SC: What kind of response have you gotten, both here and in the Middle East? In the Middle East, it was even more overwhelming. We sold out 27 shows before we even went. I was afraid at first that maybe the audiences wouldn’t speak English, and furthermore, are they going to get our references? But it was very impressive. I came away saying that they obviously know a lot more about us than we know about them. They were laughing at everything. It was the first time most of them had ever seen a group of Middle Easterners from America, or anyone from America. They were very appreciative of it. Aron Kader actually mentioned it when we were in Kuwait: We were the first Americans that were there to entertain the Kuwaitis and not the troops. SC: What have you found through your experience as a comedian about the nature of laughter? MJ: I think that laughter is contagious. We’ve done shows where there are eight people in a room and it’s one in the morning. When people are scattered, it’s harder for them to laugh. When they’re close together, it’s a lot easier. Part of it is maybe having permission. If someone else laughs, then I can laugh. So there’s a kind of freedom in that. It’s being relaxed. The first thing you’ve got to admit is that no one is perfect. When you try to show a perfect façade, you’re denying the fact that you go to the bathroom, sometimes you pee on your leg. Sometimes you fart. Sometimes the nose hair grows out and you look silly. And yet you’re the leader of the world. So if you don’t look at those imperfections, and go,” I’m not perfect,” then I think it’s sad. I think you end up living a very constrained life.